It's been a while since I did a nail inspiration post. 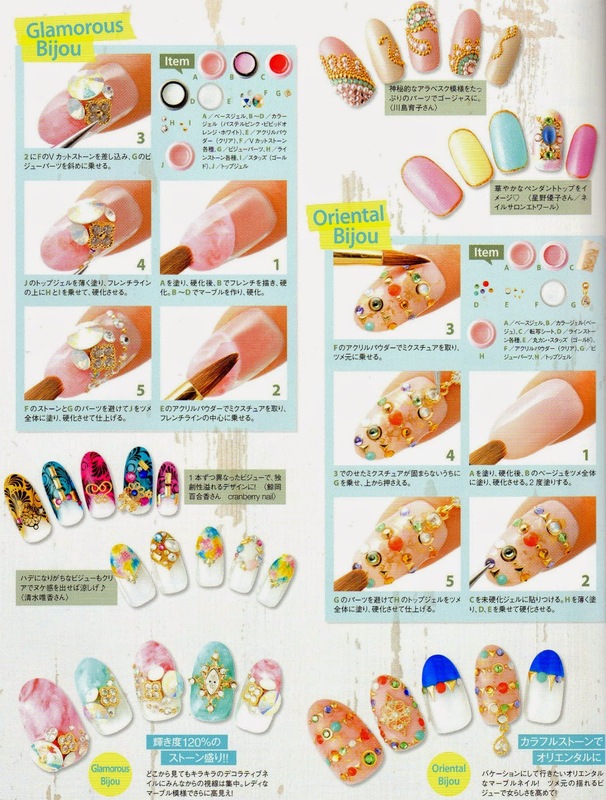 There is a summer nail art trend in Japan right now that I really love! Jewel nails! Glitter, crystals, shells, if it sparkles, it has to be on your nails! 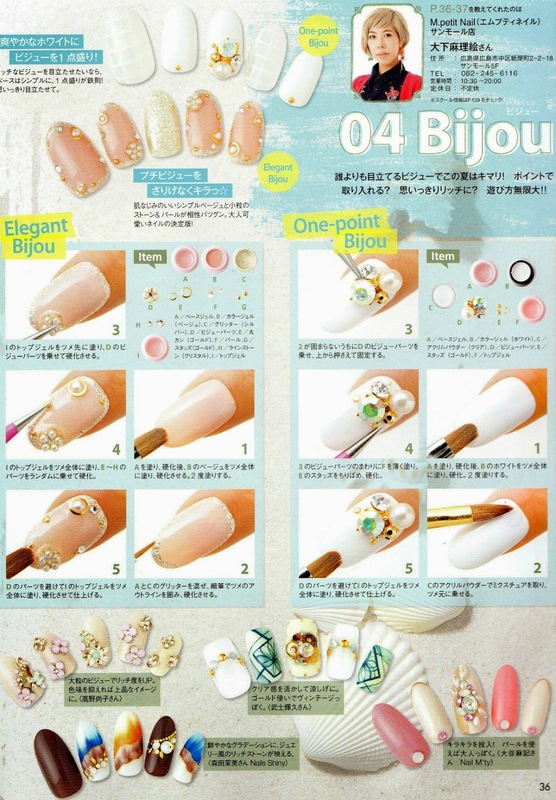 Let's take a look at some jewel nail art tutorials from the latest issue of Nail Up! magazine. 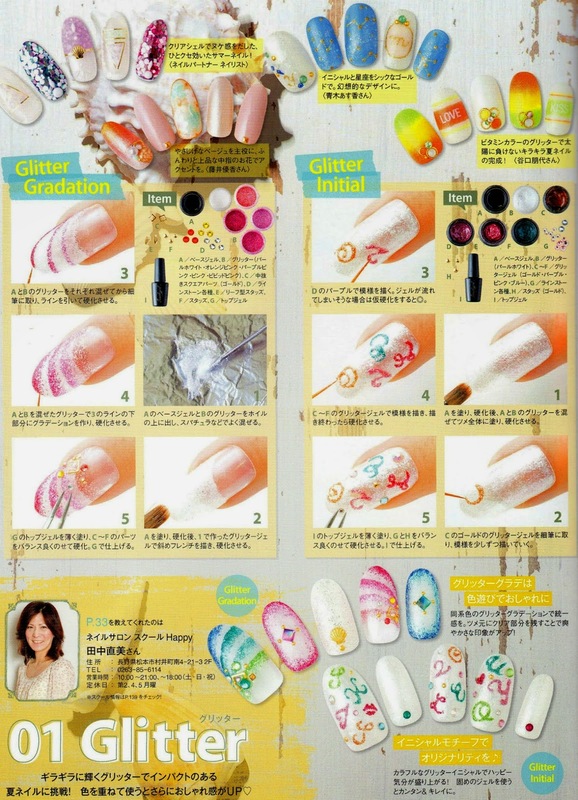 If you love sparkly kira kira nails like me, this post is for you! When deciding on a nail art design, there are some things to consider. First of all our main colour. All colours work well with sparkle but it is best to decide on a colour scheme before we begin. Then we have to decide on the item, meaning the medium we will use to achieve sparkle. It can be glitter, spangles, shells, crystal flatbacks or crystal chatons. Depending on the items, we will use the appropriate method. If we use glitters we will use top coat to seal them, but for rhinestones we will need nail glue to secure them in place. And of course for every method you can use gel. An all time favourite for all nail art lovers, is glitter. Easy to use and in a huge variety of colours, it is the easiest way to add some sparkle to your nails. You can also use spangles for a more subtle yet still sparkly look. 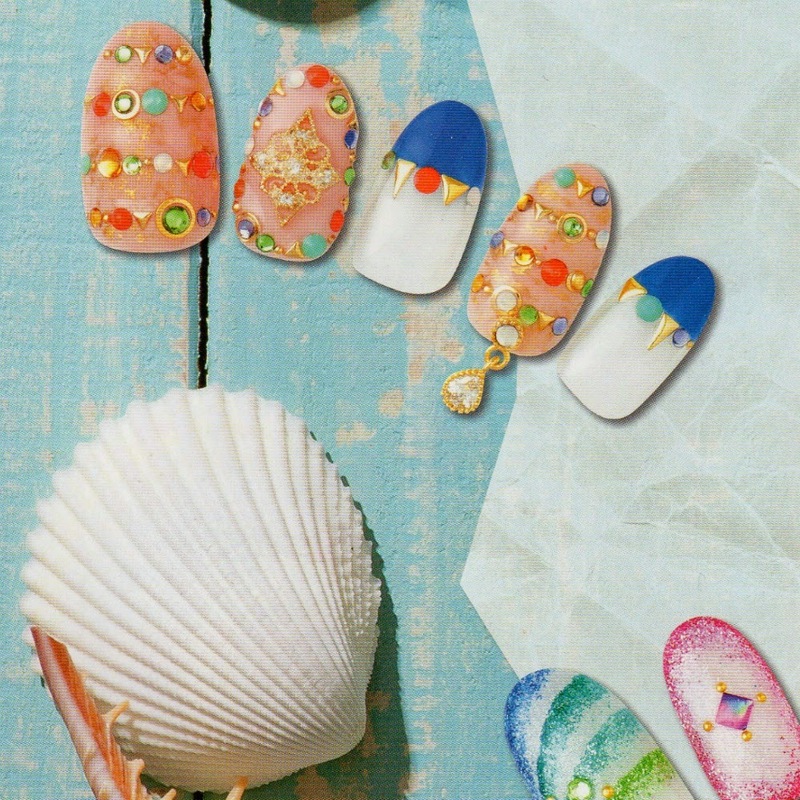 Shell nail art can be a bit tricky but the end result is always fantastic! And last but not least, crystals in every shape and form. 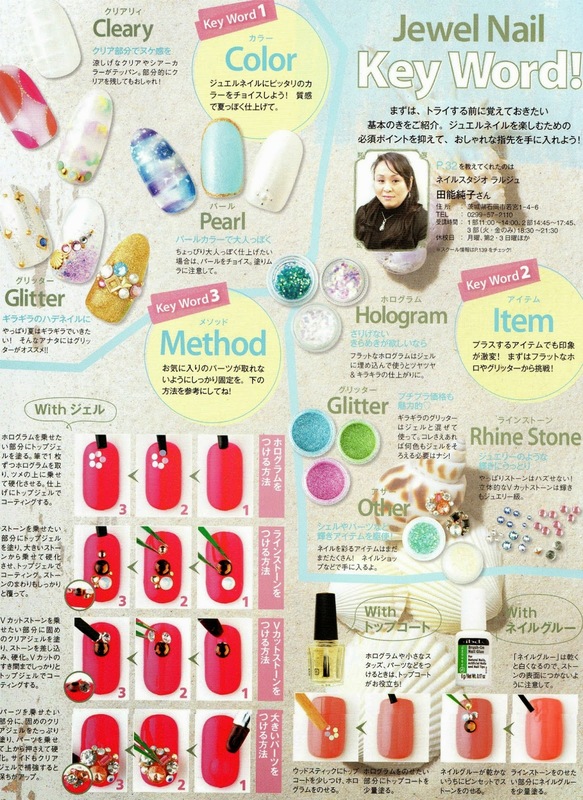 They add glam and shine to all types of nail art and they work great both for everyday looks and for specal occasions! Which type is your favourite dear readers? Do you like jewel nails or do you prefer somethin simpler on your nails? And don't forget, for a chance to enter some nail polishes and other kawaii goodies, enter my ongoing giveaway! p.s. 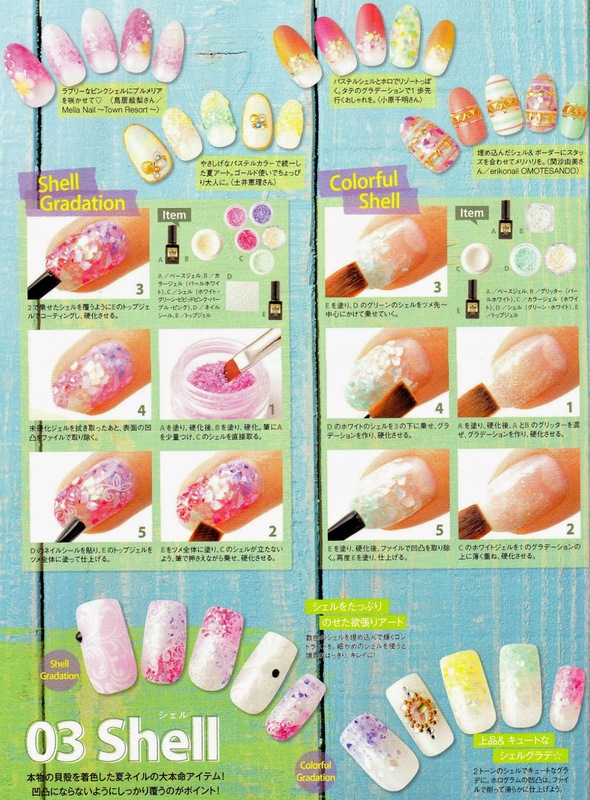 These images were scanned by me but all the content belongs to Nail Up! and the respective nail artists. Please do not use without permission, thank you! And remember, you can always click on the images to see a bigger version. Thank you very much for sharing such inspirationa pictures!! 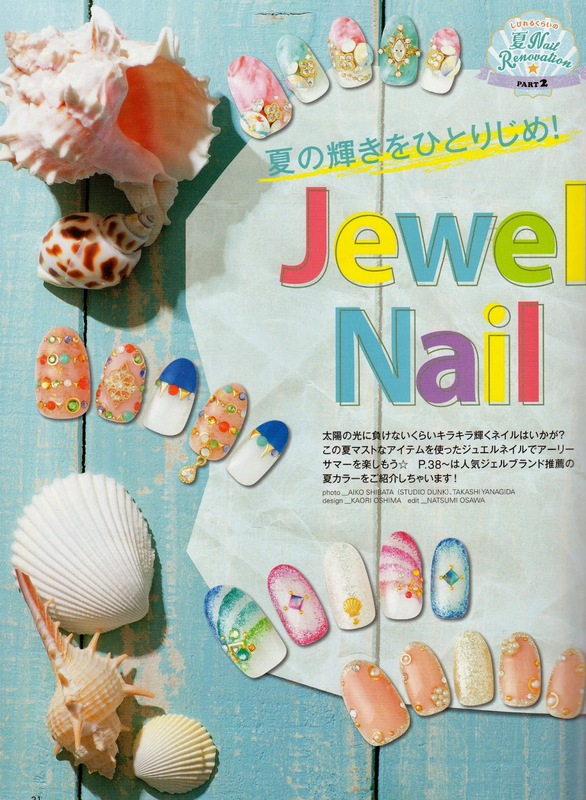 Love the summer nail trend a lot! The designs are so cute and pretty! !